Starlings that have taken possession of a flicker box can easily be trapped in the box by sliding this hole cover closed. It is intended to be used where the flicker box is too high to easily reach from the ground. Any stick, pole, or pipe of appropriate length can be used to knock the slide closed. Then the box can be lifted off its mounting bolt and lowered to the ground to safely retrieve the starling. A thumb screw adjusts the tension on the slide so it won't move by accident and can also be tightened so the slide will be locked either open or closed. 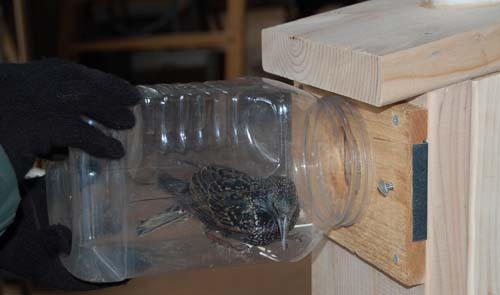 Once the flicker box with the trapped starling is lowered to the ground, a wide mouth plastic jar is placed over the entrance hole and the slide opened. As the starling jumps into the jar, the slide can be closed or the starling quickly caught with your free hand. When the box is mounted under a window, I find it easier to simply remove the camera cap and reach inside through the pvc tube. My arm fills the 4" tube so that the starling can't escape. The sliding hole cover is easy to reach on this wall mounted flicker box. With the starling trapped inside, the box can then be lifted off the mounting bolt and taken inside the building. Where starlings are a problem, this is much more convenient than repeatedly using a ladder. 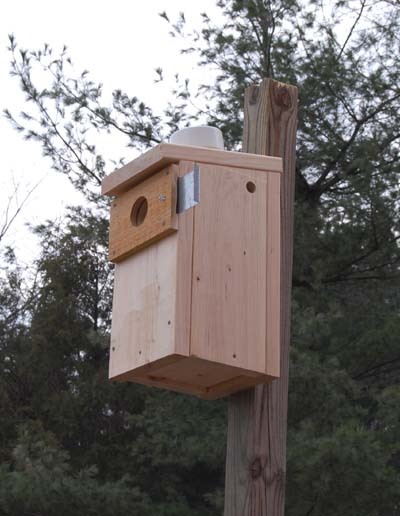 However, if you must pole mount your nest box, it needn't be high. Flickers will readily use boxes only 5' high. 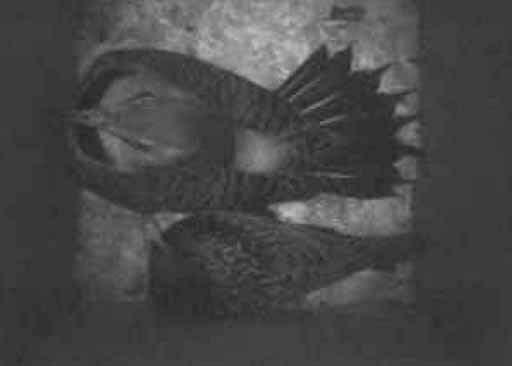 Before flickers claim a nest box, I monitor the box for either starling or flicker visits, using a video capture box with motion detector. This provides a video record of every vist along with the exact time. 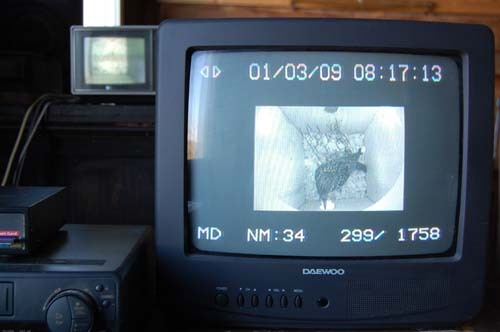 The screen below shows a starling's first visit to a flicker box in which a male flicker roosts each night. The flicker left for the day at 7:28am and the starling arrived at 8:17 and made several brief visits during the morning. I closed the hole cover during its last visit. Today, Jan 6, 2009, the male flicker returned to find another starling in the nest box. Amazingly, this time the flicker won! See starling vs flicker battles. Tonight, the flicker is back roosting in his box and all seems well. While the photo (right) shows the two opponents side by side, this is the only frame of dozens where the feathers aren't flying. And, it only lasted a split second, when the flicker first entered the box and dropped to the floor. &COPY; 2009, American Artifacts and Richard Van Vleck, Taneytown, Maryland.